PUPPY SEMINAR to dispel myths and share our personal experience, opinions and popular research to training a puppy that will become the perfect family companion. The first weeks in a puppy’s life are critical in determining the temperament of the dog. 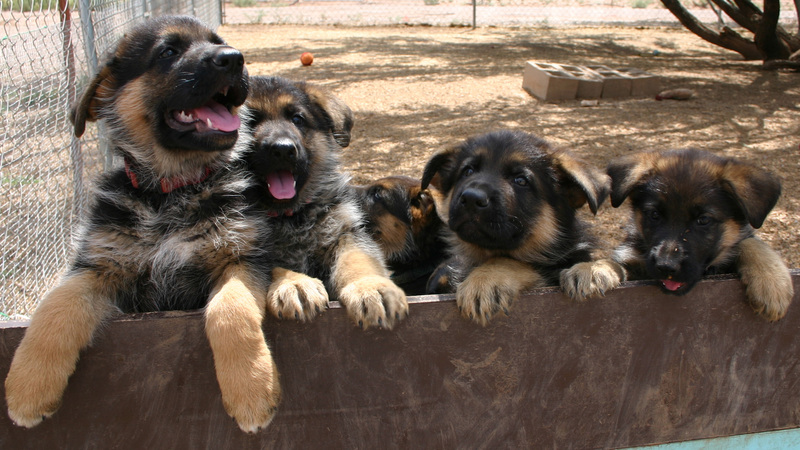 Just like a child, some of the puppy behaviors are inherited; determined by breed, determined by genetics. However, many of the behaviors are learned. If the mother is taken away too soon the puppy will not learn proper social behavior. A good mother and a proper whelping box can teach a puppy the importance of eliminating away from where he eats and sleeps. This will go a long way to making potty training a breeze. If the puppy is taken away from his littermates too soon he doesn’t learn to play well with others and such lessons as bite inhibition, etc. Remember, the first 16 weeks of a puppy’s life is similar to the first 5 years of a toddler’s life. Events that seem insignificant to you may shape your puppy’s personality for years to come. Dogs think in pictures and a puppy has a clean slate, a blank album. A few tips and tricks will help you fill your puppy’s mental photo album with positive images. DID YOU KNOW… that if you ring the doorbell and knock on the door every time you arrive home that your puppy will never become a “door rusher” barking his head off every time the doorbell rings? DO YOU UNDERSTAND…why your dog is potentially a threat to the postman? The answer is simple. Each time the postman comes to the door to deliver the mail your puppy learns quickly that if he barks he is rewarded by the postman going away. (Little does he know that the postman goes away regardless.) As the puppy matures, he becomes bolder until maturity catches up with attitude. And soothing your growling dog is only encouraging him to continue this behavior. Same with a dog that is afraid of loud noises or thunder. Soothing him encourages his fear. DO YOU KNOW… what to do in the event that a dog is off leash and running toward you and your dog? If there is not the threat of traffic you should drop the leash to minimize aggression. Often by dropping the leash you can avoid conflict. DID YOU KNOW... that you should never use a collar with a plastic clasp to walk your dog? Only a collar with a buckle or a slip leash. Plastic clasp collars should only be used for identification purposes. DID YOU KNOW… that a harness only encourages your puppy to pull? All pulling dogs such as huskies, work dogs, cart dogs etc. use harnesses. If you want to teach your puppy not to pull you should introduce him to a slip leash. DID YOU KNOW... that there are 100’s of things you can do with your puppy the first 6 months of his life that will give him positive experiences, open up his mind to learning, create a bond between you and your puppy and give your puppy a desire to explore the outside world. The Dog Knowledge encourages you NOT to enroll your puppy in any type of formal training before the age of 6 months. Instead build a lasting bond with your puppy, teach your puppy basic manners and be your puppy’s best friend. Then at 6 months, once teething is behind your puppy it’s time to begin more structured formal training. But even then, make it fun and positive.